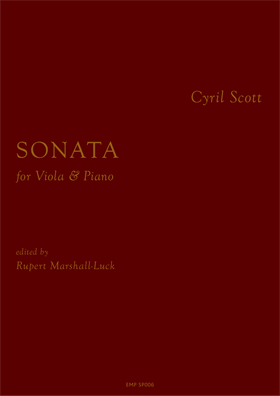 We are delighted to announce that Cyril Scott’s Viola Sonata of 1953 has been published and is now available to purchase for the first time. The Viola Sonata is, like all Scott’s output, a wholly individual work; and its principal preoccupation is with the colouring of melodic lines and with rhythmic development. This exploration is, however, presented in a decidedly organised context, with relatively simple large-scale forms and the structural use of readily recognised features such as tempo changes making the Sonata a highly accessible work. The work received its World Première recording on the label EM Records by Rupert Marshall-Luck (viola) and Matthew Rickard (piano). Hitherto unpublished, this new edition uses as its basis the composer’s autograph manuscript, generously made available by Desmond Scott. It is prepared to the highest modern standards of scholarship and includes an appended set of Editorial Notes, which incorporates full details of the sources used and bibliographic references; a Summary Explanation of Editorial Policy; and an Editorial Commentary, in which each alteration to the composer’s autograph is explained and the reasons for the alteration given. Please follow this link for more details of the score and for PDF previews; or, to buy, visit the PURCHASE page. The biography of Norman O’Neill by Derek Hudson, which has recently been issued in a new edition by EM Publishing, has received a glowing review in ‘Classical Music’. Lauding it as ‘an important and well-written book’, Philip Borg-Wheeler highlights in his review several salient aspects of the biography, which paints O’Neill as a composer ‘universally loved’ and for whom ‘so many of his colleagues and acquaintances express their affection’. Revised and extended for re-publication, the present volume, overseen by the author’s daughter, incorporates additional end-notes compiled by Stephen Lloyd, including a list of compositions and details of historic recordings, as well as several photographs not previously published. Please follow this link to read the full review; or visit this page for more details of the book, including PDF previews. EM Publishing will shortly be issuing its first score by a contemporary composer: the Sonata for Violin and Piano, op.130, by Stephen Matthews. The Sonata, composed in Spring 2008 for the violinist Rupert Marshall-Luck, was written as a response to the death of the composer’s father; and, in Matthews’ own words, ‘expresses much of my personal experiences and feelings over the last few years, being by turns turbulent and anguished, joyful and calm’. The work is unified by a motto theme, first heard as a heartrendingly poignant melody high in the violin’s register, and this slowly-descending modal scale forms the basis of all the subsequent principal themes of the piece. From the frantic ‘perpetuum mobile’ of the first movement’s ‘Vivace’, through the carefree waltz of the second movement and the slightly acidic spikiness of its contrasting episodes, to the alternating dark turbulence and sunlit tranquillity of the Finale and its final, sublimely soothing gesture, this is a work that intimately explores and wholeheartedly expresses the full gamut of human feeling.